Its that time of year when fruits and vegetables are coming on in full force. One of the veges that there always seems to be a surplus of is green beans. This happens when you grow a large garden of them, as well as if like us, you grow between 50 and 150 acres of green beans annually. 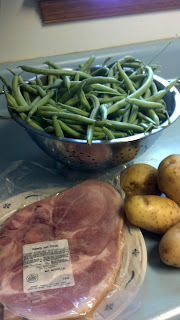 As a result, green beans are something that we never have a shortage of. When I open my deep freezer to see what to make for dinner, if its in there and its green...its a bean. You'll notice this machine on the front page of my blog. 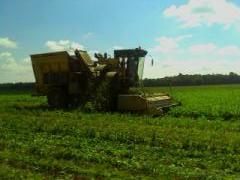 This is a green bean harvester. We planted about 50 acres of green beans today, June 30th. They will be ready for harvest around August 30th. Green beans take about 60 days from planting till harvest. In a good year, we will harvest 200 bushels per acre. Thats a lot of green beans! Green beans were one of the vegetable crops that was easy for us to diversify our farm because we can use the existing equipment that we already own. It would not be cost effective for us to grow green beans if we need to buy specialty equipment in order to grow them. We are fortunate because the company that we grow green beans for brings in the harvesters so our main job is to plant and tend the crop until harvest. Green bean harvester picking fresh market green beans destined for the grocery store. All our green beans are grown for the fresh market in the Washington DC, Baltimore, and MidAtlantic region. This is a perfect example of a family farm supplying fresh produce to the grocery store, but whose face you never see. Many of us produce growers grow for certain brands or certain companies but because they are supplied through a distributor, the customer at the store has no idea that the produce is actually locally grown by a family farm. I think that is one of the biggest mistakes customers make at the grocery, assuming that because its not from a farmer's market or farm stand, that it must have been shipped in from afar. In season, that generally is not true. Most grocers source locally and regionally in season. There are specific uniformity, size, and shape requirements for fresh market green beans. If the beans don't make the grade for fresh market, then they end up at the cannery and are processed into canned green beans. 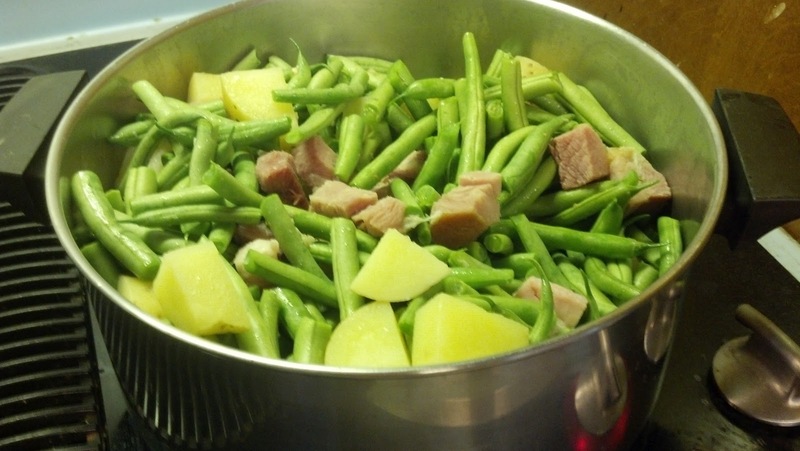 I have several very distinct memories of green beans growing up. Picking green beans was a chore my older sister and I hated. It was always hot and it was always tedious. We didn't appreciate the homegrown aspect of our parent's garden back then. It was just one more chore we had to do. Another is sitting by a farm pond snapping beans. Down the road was a neighbor who had a pond fed by an underground stream that was open to the neighbors to use. It was the pond where I took swimming lessons as a child. It was also the pond I remember snapping green beans with my mom and my 4H leader. Finally, my mom is famous for canning her "dilly beans". 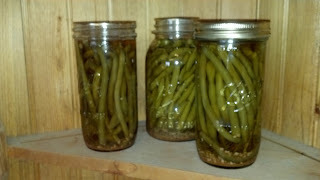 We LOVED these spicy pickled green beans as kids and it is one of the things I love to can when our green beans are ready. I taught my daughter this recipe and has entered them in our county 4H fair. So I want to share with you a couple recipes to help use up that surplus of green beans that you have from your garden or maybe your neighbor dropped off on her way by (like mine did this evening). Like I said, we just planted green beans today, so I have none of my own but was the welcome recipient of a generous neighbor today! I use turkey stock left over in frozen containers from Thanksgiving. Stewing the carcass of the turkey will give me many quarts of stock to use throughout the year for various dishes. Bring the stock to a boil. Add the ham and let it simmer for 5-10 minutes. The stock plus the ham add a wonderful flavor to the veges. 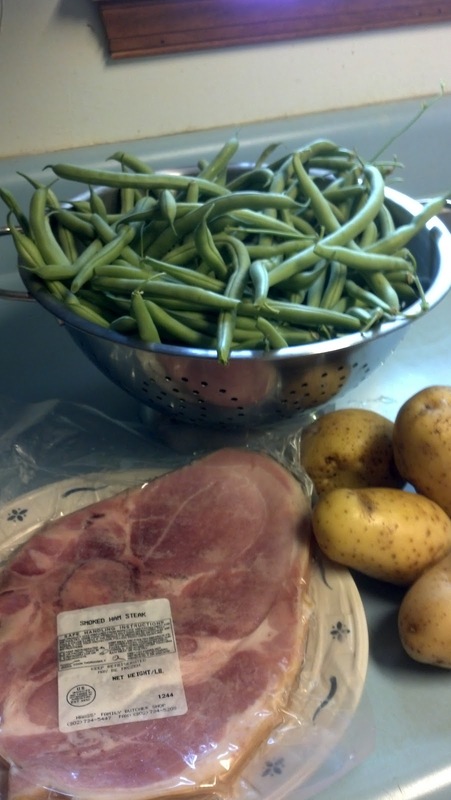 Add the potatoes, green beans, garlic, salt, and butter. Reduce the heat and simmer until the potatoes are soft. We eat this as a main dish even on a hot summer night. My favorite green bean recipe as I said above is "Dilly Beans". This makes 8 pints. 1/4-3/4 cayenne pepper per jar depending on how hot you want them. Stuff bottom of jars with seasonings. 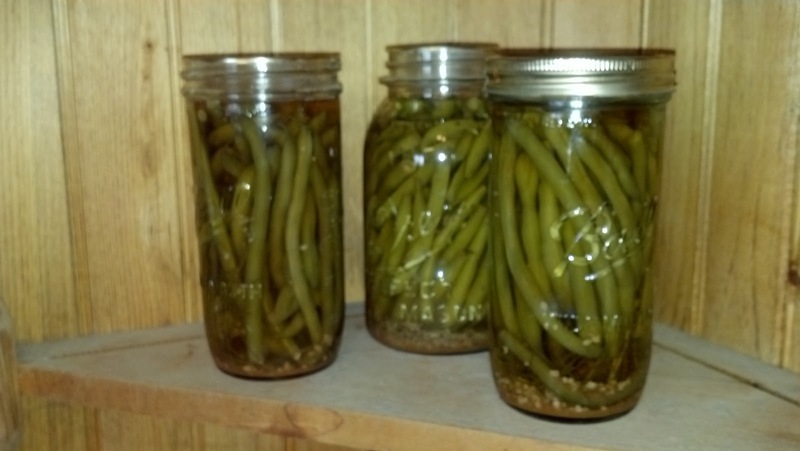 Add green beans lengthwise, leaving 1/4" head space from the top of the jar. Combine water, vinegar and salt in a pot and bring to boil. Pour boiling hot over beans, leaving 1/4" head space. Adjust caps loosely and process for 10 minutes in a boiling water bath. Let beans stand for at least 2 weeks before tasting to allow for flavor develoment. This is all I have left of last year's Dilly Beans. Hope they last till the this year's crop comes in! ﻿Enjoy the bountiful harvest this season!